Exhibit F is a San Diego four-piece that combines a bit of metal influence with a blend of angry prog-rock to create what they describe as a "rare alchemy of heavy sound". Sounding at times like L7, Veruca Salt, and even Heart, the band certainly carves out a niche all their own with plenty of heady experimentation. 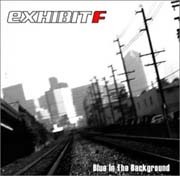 Blue In The Background is Exhibit F's debut full-length, and as such serves to showcase the band's wealth of talent while at the same time underscoring a couple of opportunities for improvement. Always wanting to focus on the positives, I have to start out with my favorite track on the album - "Heir". Everything gels on this song, resulting in what could certainly be a radio favorite even on the commercial conglomerates. The opening riff of Chris Lawrence is catchy and upbeat. Singer Melle delivers a strong performance that brings Pat Benatar to mind. The song is simple and infectious, though quite short. In fact, five of the tracks on the album clock in at well under the three-minute mark. Elsewhere on the disc, there are flashes of brilliance that indicate the serious potential lurking just below the surface. The strong riffs on "Sliding", Melle's mesmerizing vocals and Jeremy Turner's groovy bass on "Beauty", and again the heavy riff on "Slip Away" are just but a few examples. Just as evident, however, is the looseness of the songwriting. In several cases, the frequent time changes of drummer John Duffy and the meandering paths of the other musicians leads to a feeling of an open jam session which serves only to break up the flow of the song. Maturation as songwriters will certainly overcome this obstacle, and with the talent the four-some possesess it's only a matter of time before they tighten things up on a more consistent basis. Without question, Blue In The Background is a solid debut for these Californians and is certainly of interest to any fan of "art" rock or prog rock that has a tough, and at times dark, edge to it.